Darjeeling: Bimal Gurung's wife, Asha Gurung, said on Tuesday that she would continue to head the Gorkha Janmukti Morcha's women wing, days after the Binay Tamang faction had said there was every possibility that she would not be included in the central committee of the Nari Morcha. Dinesh Gurung, a core-committee member, who is close to the Tamang camp, had earlier said no one in the Nari Morcha's central committee wing knew who had appointed her as the head of the core-committee and when. 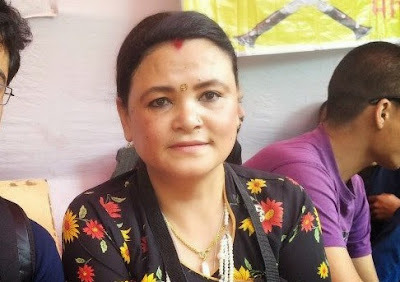 Asha posted a message in the Morcha's WhatsApp group on Tuesday, saying "Dinesh Gurung had raised certain questions and I would like to state that I, along with six members, were included in the core committee (of the women wing) in the Singamari office of the party on December 12, 2009 by president Bimaljiu and other central committee members." Asha said the Tamang faction had no authority to remove or add members from and to the Morcha as the rebels were no longer with the Morcha but with the Trinamul Congress. Meanwhile, Jyoti Kumar Rai, assistant secretary of the Morcha, who had switched allegiance to the Binay-Anit camp recently held a press conference in Darjeeling on Tuesday and said: "I used to go to the Singmari party office where Bimal Gurung, Prakash Gurung, Pravin Subba and Dipen Mally used to stay permanently. I used to suspect that they might be involved in the blast but now after youths from Pokhriabong have disclosed how they used to receive instructions, I am now convinced that the four leaders used to pass on instructions for such undemocratic activities." Bimal Gurung's wife, Asha Gurung, said on Tuesday that she would continue to head the Gorkha Janmukti Morcha's women wing, days after the Binay Tamang faction had said there was every possibility that she would not be included in the central committee of the Nari Morcha.